The latest release of UAD’s plugins (V7.2) includes two new Brainworx ENGL guitar amps and a tuner. Universal Audio regularly poll their users to find out what sort of plug-ins they want developed next (I just responded to one of their surveys the other day), so I assume guitar amps must have rated pretty highly on the list lately. Although I think I’m more into the nice UAD compressors, channel strips and reverbs, I have to admit that I’ve found myself using the UAD version of the Softube Vintage Amp Room and Bass Amp Room plugins quite a bit lately. I don’t consider myself a real guitarist (ahem – I’m a bass player) but I’ve played guitar in bands and on recordings for about 20 years or so, and recorded an infinite amount of other people’s guitar solos. As I can’t remember the last ENGL amp I used in the studio, it will be interesting to see what these new ENGL plugins bring to the game. I’d have it by now if my Firefox beta wasn’t screwing with my downloads. “Snap” – two hours later, I’ve had some dinner, installed the update and opened the new plugins in LogicProX. I plugged my Fender Jag-Stang with EMGs straight into the Hi-Z input on the front of my UA Apollo and flicked through the presets in both versions of the ENGLs – the E646 VS and the E765 Retro Tube. The first thing I realised was that I needed to replace the strings on my guitar – they are pretty dead. The next thing I noticed was that the ENGLs have a really authentic presence, especially on the clean tones on the E646 VS. It has that sweet almost-rattle in the valves with a smooth progressive grittiness to the note attack. The intermodulation distortion between notes of a chord is beautifully rich and creamy. The cabinet sound feels like a real miked-up cabinet in a studio, with a tight but visceral attack on the low notes. Actually the latency, though pretty low, was annoying me while playing through Logic, so I inserted the plugins straight into the Apollo Console app. This removed all the latency and made the response feel totally immediate. I also figured out how to record both amped and clean guitar at the same time, but that’s another story. I’ve been using Native Instruments Guitar Rig at home for years now, and loving the tones I can get with it. I’m also pretty impressed with the new guitar and bass amps that come with LogicProX. But there’s definitely something more “real” with the ENGLs – if you close your eyes you can almost “see” the guitar amp in the room. Moving into the more distorted tones of the E646 was satisfying, but with high-gain settings it lost some of the magic real character of the clean tones and felt slightly more “generic”. There’s some nice tight metal presets in here though, as well as some nice classic and alt/punk rock sounds. There’s a delay included as well, plus you can trim the input from the guitar (to match pickup types) and pull the cabinet level back with a powersoak knob. 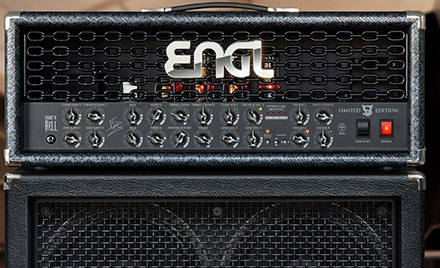 The ENGL E765 Retro Tube amp sounds a lot fatter and warmer than the other amp. The clean tones are a lot grittier/crunchier but still fat sounding. The distortion tones are really nice and creamy – again they tend to become a little oversaturated after a while and begin to sound more like some other plug-in guitar amp versions. 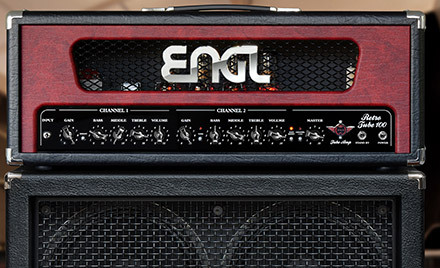 Both amps are overall a pretty solid offering. It feels like there’s some tasty non-linear modelling going on in the amp head section, because the tone and harmonic content reacts nicely to playing level and style. The cabinet/ambience feels like it is provided by a more linear captured impulse response. Overall I thought both of these amps are impressive. I love the clean amp sound on the E646 VS so much I can see myself using it quite a lot in the future. Oh, and the new Brainworx tuner is a handy little plug-in. It’s simple and tracks pitch well. You can adjust the meter ballistics and have it automatically mute or dim the level on the guitar while tuning-up. Nice.